The number of international students enrolled in U.S. schools during 2015-16 academic school year jumped 10 percent from the previous academic year to 974,926, a report from the Department of Commerce’s International Trade Administration (ITA) showed — an 89 percent bump over the past 15 years. The top 10 countries sending the most students to study abroad in the U.S. includes China as the number one “sending country,” followed by India, South Korea, Saudi Arabia, Canada, Brazil, Taiwan, Japan, Vietnam and Mexico. “By 2025, the OECD [Organization for Economic Co-operation and Development] forecasts that eight million students will be globally mobile. This figure is up from just 2.1 million students in 2000. Last year, the number of students coming to the United States totaled almost 975,000, a 10 percent increase from the previous year and an 89 percent increase over the past 15 years,” the ITA report states. U.S. schools compete with other countries’ educational institutions for foreign students. 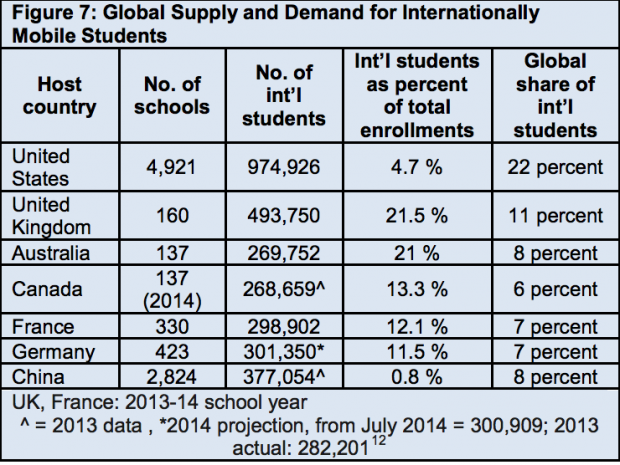 There are 4,921 schools American-based schools where the nearly 1 million international students study. In comparison, the United Kingdom offers 160 schools for the 493,750 foreign students they host during the academic year. China, however, has more than 2,800 schools where 377,054 foreign students go to study. The fate of some international students coming to the U.S. was questioned after the Supreme Court ruled that the Trump administration’s revised travel ban could take partial effect before the court hears the case. The limited ban restricts travelers from six Muslim-majority countries Iran, Libya, Somalia, Sudan, Syria and Yemen with no prior connections to the U.S.
USA Today reports that students who receive an acceptance letter from a U.S. university will be given entry with a valid visa. This is considered a “bona fide relationship” with a U.S. entity, as per the requirement from the high court’s ruling.